US Wheel adapters offers 6 lug wheel adapters in hub centric and lug centric designs. All adapters manufactured using 6061 T6 Billet Aluminum. Adapters in stock ship same day if ordered before 2 PM Central Time. Shipped by USPS, allow 2-3 days for delivery. For overnight orders please call our experts at! 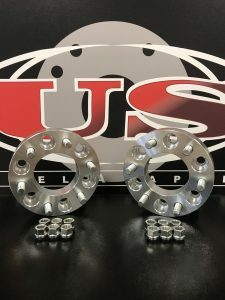 US Wheel Adapters offers the ability to manufacture wheel adapters based on the specifications of your vehicle and wheels. Use the full build pages below, OR select one of our common custom builds. Common custom builds are provided to insure easy access to popular adapters.